This painting has been known until recently as The Goldweigher or Girl Weighing Pearls . Microscopic analysis, however, has revealed the pans of the balance to be empty. The highlight on the pans is not rendered with lead-tin yellow, which is used elsewhere on the canvas to depict gold. Vermeer represented pearls with a thin gray layer topped with a white highlight. The pan highlight is a single layer. In addition, there no loose pearls on the table that would indicate other pearls waiting to be weighed. This seemingly trivial analysis as to what is being weighed actually bears importantly on the meaning of the work. For Woman Holding a Balance is overtly allegorical. The woman stands between a depiction of the Last Judgment hung in a heavy black frame and a table covered with jewelry representing material possessions. The empty scale stresses that she is balancing spiritual rather than material considerations. 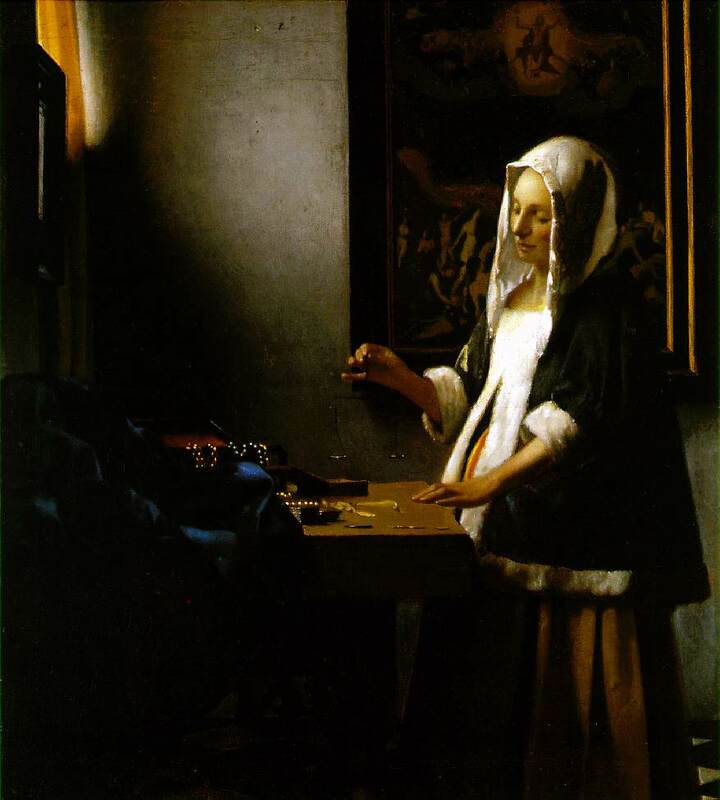 Vermeer's portrayal does not impart a sense of tension or conflict, rather the woman exudes serenity. Her self-knowledge is reflected in the mirror on the wall. Vermeer's point is that we should lead lives of moderation with full understanding of the implications of a final judgment. The composition is designed to focus attention on the small and delicate balance being held. The woman's arms act as a frame, with the small finger of her right hand extended to echo the horizontal lever of the balance. The bottom of the painting frame is even altered to provide a partial niche for the scales. The frame ends higher in front of the woman than it does behind her. The complex interplay between verticals and horizontals, objects and negative space, and light and shadow results in a strongly balanced, yet still active composition. The scales are balanced, but dynamically asymmetrical. A cleaning in 1994 revealed previously undetectable gold trim on the black frame that provides a tonal link to the yellow of the curtain and the woman's costume. Vermeer has endowed Woman Holding a Balance with more overtly allegorical context than his other domestic scenes. As such, it loses some of the invitingly subjective interpretation of a less direct work such as Woman in Blue Reading a Letter . Nevertheless, Vermeer's masterful composition and execution produced a powerful and moving work.